Download pdf file - Guide for Tourist wishing to . Download Word doc files here. Whole Body Detoxification and Rejuvenation. Root Cause Investigation, Diagnosis and Treatment offered for all Chronic Health Challenges. Herbal (Modern Ayurvedic) + Intracellular Nutritional Treatment for all Cardiac Problems, Diabetes, Thyroid / Hormonal Imbalance, bioidentical hormones, Hypertension, UTI, Body Aches / Pains, Arthritis, Obesity, PCOD, Fibroids, Migraines & Kidney / Prostate Diseases. We are a well established Clinic catering to the special needs of Medical Tourists since the last decade. We have been assisting patients from USA, Europe, United Kingdom, Hong Kong, Dubai, Singapore, South Africa, Saudi Arabia and other neighboring Asian Countries. For an Introduction to SpaceAge Health Center please download a pdf file 12.0 MB (broadband required). We have assisted over 7,000 patients at our Health Center in Mumbai. Over 200 Celebrities and over 400 Senior Doctors from all over the world have undergone Treatment at our Health Center for all kinds of Chronic Ailments. We specilize in Detoxification and Rejuvenation of the body along with other Anti-AgingTherapies. We also repair and service various organs of the body through the use of Orthomolecular Medicine / Intracellular Nutrition. Results are evaluated through regular Pathology Reports / Lab Tests. The focus of our Clinic is on Holistic, Herbal and Natural Treatments. We are especially geared to help Foreign Tourists. Everything is done naturally, without the use of drugs, chemicals and synthetic Hormones. Our Health Center serves as Medical Counselors to Doctors worldwide. We have been invited to participate in various International Anti-Aging Medical Conferences, Masters' Courses and Workshops all over the world. The Clinical Studies presented at A4M - American Academy of Anti-Aging Medicine at Orlando, Florida, USA are published in the Therapeutic Manual Volume 12 which serves as Desk Reference Textbooks for MDs worldwide. A4M is the worlds largest Anti-Aging Organization having a membership of over 22,000 Doctors. Newsletters covering the activities of the Health Center during the past few years are available on our website for your ready reference. 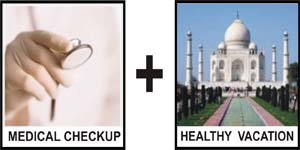 We request Medical Tourist desiring to visit India for treatment of all types of Chronic Ailments to contact us by Telephone or e-mail and visit our website on the Internet. We will be more than happy to be of assistance to help you achieve your goal of Perfect Health and life free from prescription drugs. We interact and guide Tourist even before they arrive in India and continue to help them even after they go back to their own country or are traveling around the world. We offer Online Consultation all over the world via the Internet. Our Health Center looks forward to assisting the needy. ©1995-2011 SpaceAge Concepts (India) Ltd. All Rights Reserved.